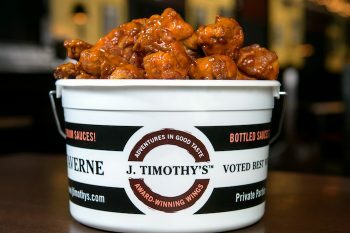 Come. Come with me on a journey into the mind of a madman. 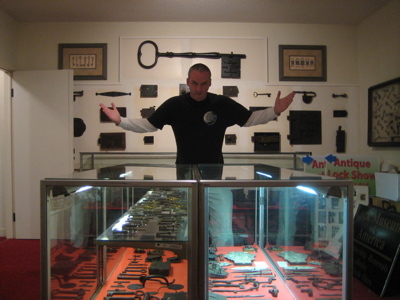 No, not me, but Tom Hennessey – the guy most responsible for the wonderful insanity (some blowhards would say inanity) of the Lock Museum of America. 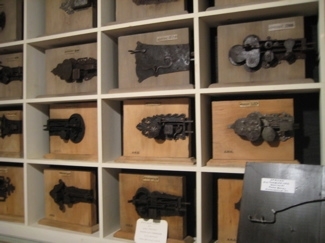 At the outset you should know… This museum contains nothing but locks. Okay, there are keys too, but that’s it. Nothing else. At all. And I loved it. So did Dan, who was wrapping up his day long CTMQ adventure with me out here in Terryville at the lock museum. After a full day of museum going (you can see our itinerary for his profile of me here), Dan was positively giddy (and a bit punchy) nearing the end. For my part, I was quite happy too. Why? Because I had shown Dan a solid day of what this website is all about. We went to a wide variety of museums, met some wonderful docents, learned a bunch of stuff we didn’t know we cared to learn and here, at the lock museum, it all came together for him (I think). Totally random, singularly devoted to one subject (Locks! ), and decidedly quirky, I had created a convert in Dan. 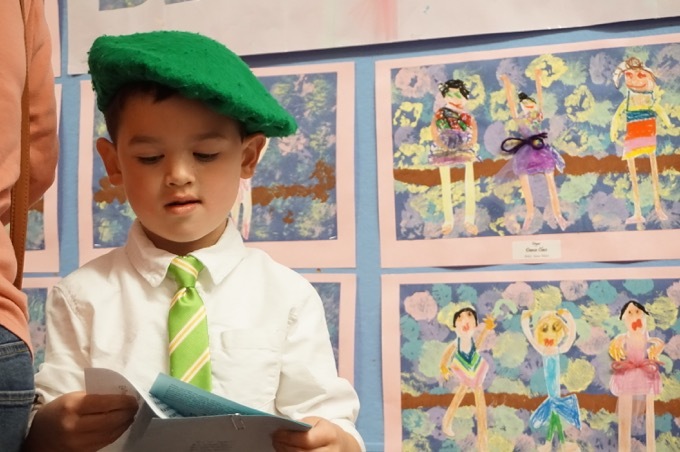 He grew up in Connecticut and went to Yale, but like 99% of the public, had never really delved into the seemingly mundane to find the exquisite. Now he had… And like I said, he was loving it. Not that either of us gives a hoot about locks. They are merely functional and important little pieces of hardware that we navigate several times a day without thinking about them. We lock our houses with tumbler locks. Our cars with automated locks. We get into our office buildings with magnetic strip reader locks. Unlock our desks with little crappy key locks. And thankfully there are those out there who find beauty and historical significance of these things to the extent that they’ve put together an incredibly large display of them in a museum setting. I shouldn’t have been surprised at the size of the collection. After all, I was wowed a few miles away at the American Clock & Watch Museum in Bristol just a month prior. (CTMQ Visit here.) Here in the industrial heart of Connecticut, where brass implements (Waterbury), clocks (Bristol/Waterbury), machine parts (New Britain) and locks (Terryville, New Britain) were made for national and international markets for years, there is a rich history of these things and several museums celebrating each towns’ past. Which reminds me… 107 museums ago, way back at my very first museum visit at the New Britain Industrial Museum (CTMQ Visit here), I had made a deal with the tour guide there. While showing us the comparatively small collection of Russwin and Corbin locks there, the guide had complained about the Lock Museum saying something about how they got a huge amount of grant money whereas the Industrial Museum got nothing. I promised him that when I made it out to the Lock Museum that I’d give them the business and ask them to donate some of their New Britain made locks to the Industrial Museum. I was totally prepared to do it too… But as you’ll read, that turned out to be an impossibility. 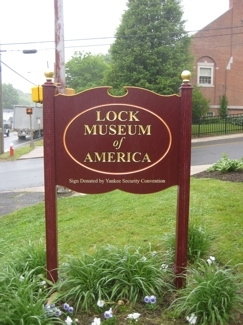 Built on the site of the original Eagle Lock Company, which began making locks in 1854, the Lock Museum of America chronicles lock-making history–a chapter in mechanical engineering lore. 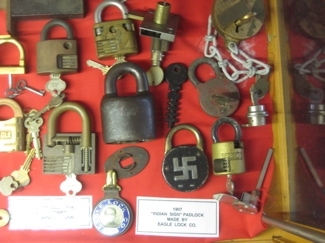 The eight display rooms house more than 23,000 kinds of locks, including vault locks, door locks, and padlocks. Think about that for a second. Twenty-three THOUSAND locks. 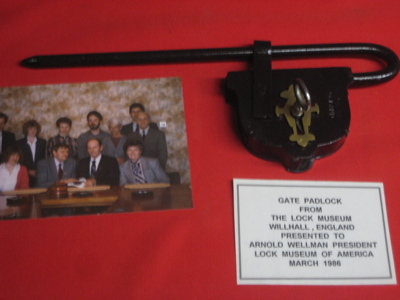 As you can imagine, The Lock Museum of America holds the largest collection of colonial and antique locks in the United States. I told you, this place is awesomely insane. Dan and I entered, paid the entrance fee and were guided by an older woman to the center of the first room. The museum is impeccably neat and obsessively organized – as it must be. As Dan and I spun around in wonderment at the locks before us. At this point, I think we thought that this room was the entire museum, which would have been more than enough. Little did we know that this was only about a third of the collection. The woman smiled at us, walked over to a wall panel and pushed a button. The next thing we knew, we were being “guided” by the pre-recorded voice of (I assume) Tom Hennessey. This was a first for me: A tape recorder tour guide. Not only that, but the gravelly recorded voice emanating from the tinny speakers was unintentionally hilarious. Even though the kindly woman had probably heard the recording a thousand times, she couldn’t contain her laughter at the disembodied voice of (I assume) Mr. Hennessey. The recording could have used a couple retakes at certain places, like when “the voice” would suffer a coughing fit or stumble hopelessly on a phrase. 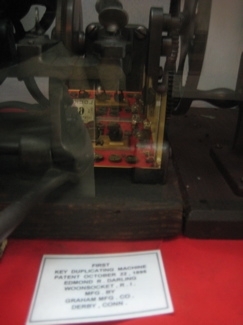 The first key duplicating machine! It was pretty funny, but c’mon… The narrator sounded like he was 115 years old and he was clearly passionate about locks. What more could a museumgoer ask for? The lady took leave of us and we were free to enjoy the tour, such as it was, on our own. Yeah, now that would be cool. 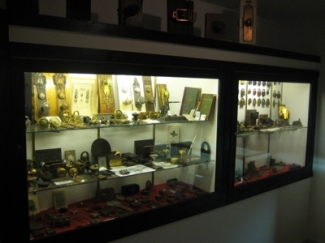 Sort of a melding of the Clock & Watch Museum with the Lock Museum! Morlocks are cool. (Morlocks are a fictional species created by H. G. Wells for his 1895 novel, The Time Machine. They dwell underground in the English countryside of A.D. 802,701 in a troglodyte civilization, maintaining ancient machines that they may or may not remember how to build. Their only access to the surface world is through a series of well structures that dot the countryside of future England. Morlocks are humanoid creatures, said to have descended from humans, but by the 8,028th century have evolved into a completely different species, said to be better suited to their subterranean habitat. They are described as “ant-like”, because they possess the ability to crawl up walls. Morlocks wear no clothing but are covered with fur. As a result of living underground, they have little or no melanin to protect their skin, and so have become extremely sensitive to light. I always appreciated Wells’ foresight and intelligence to set The Time Machine so far into the future. Anyway, there were no Morlocks at the Lock Museum, and this aside has now gone on too long. Let’s look at some real locks already. As I said, the museum boasts eight display rooms. This first one contains 23 different displays and “The Voice” walked us through each one, which as it turns out, is a pretty efficient way to go. I found myself rather enjoying it and even if you get lost in one particular bunch of locks, you can catch up with “The Voice” later as each display is numbered. 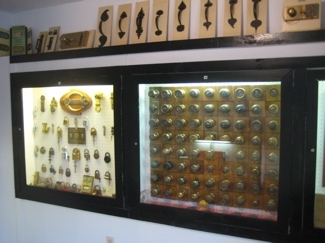 In a nutshell, the first floor contains displays containing Eagle Locks, trunk locks, padlocks, keys, cabinet locks, bank locks, colonial locks, Branford Rim locks, auto locks, old key machines and the museum hall of fame. 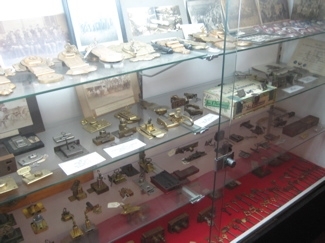 And I must mention the various collections around the room which contain – you guessed it – more locks. 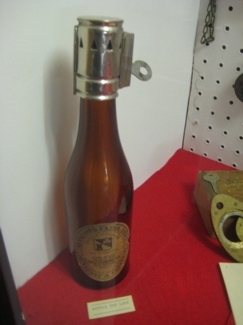 Tom Hennessey had a long career in the lock-making industry. Once retired, he didn’t stray far from his craft and is still involved with locks as much as he ever was. Heck, he even authored a book called Locks and Lockmakers of America. Once upon a time, lock manufacturers prospered in Terryville, New Britain, New Haven. 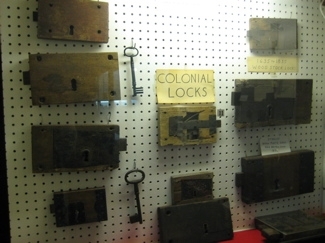 “Connecticut was the center of lock making,” Hennessey explained. In Terryville, the landmark Eli Terry Jr. Water Wheel was used to operate machinery at one of America’s first lock factories, Lewis Lock Company, in the early 1850’s. It is the only known original manufacturing water wheel left in the country. CTMQ notes: I can’t believe I didn’t make the two block trek westward to check it out. I have driven by it and will certainly make a trip out there soon and update this page. This 20-foot-in-diameter water wheel has a gear around the circumference that adds speed to the shaft which was used to operate the machinery of the factory. 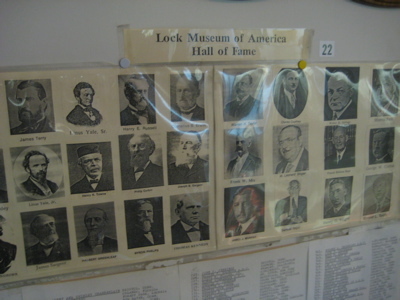 Hennessey was one of the founders of the lock museum and has been curator since it opened in 1972. 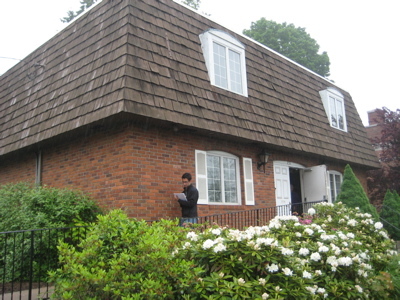 The museum has grown from a small storefront to the eight current rooms. Hennessey recently received a box from a Burt Spilker of Baltimore with over 300 keys and assorted locks. Some are over 1,000 years old and date back to Roman times – the collection is valued at around $300,000. Holy cow. Lock that thing down! Going back to the Industrial Museum’s lament, the lock museum got a $50,000 contribution from the Yankee Securities Convention, which is some sort of lock group. 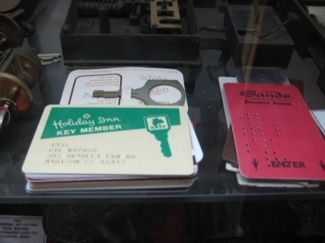 And check this out: Hennessey’s lock expertise has taken him on some interesting travels. He set up the key systems at SMU in 1963 and saw President Kennedy’s motorcade pass by about five minutes before he was assassinated. He also set up the key in system for the World Trade Center which had 46,000 Corbin locks. Hm, maybe this guy should stop traveling. 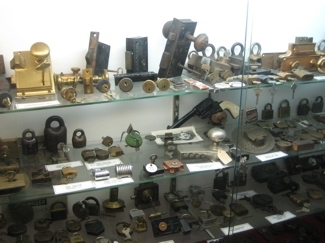 The newest room exhibit is an extensive lock collection that includes a Cannon Ball Safe, 30 early era time locks, Safe Escutcheon Plates and a large number of British Safe Locks, Door Locks, Padlocks, Handcuffs and Keys. 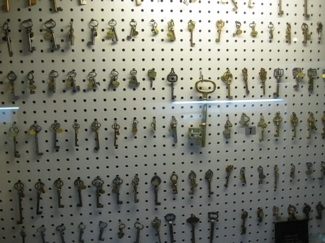 Another display room, known as The Eagle Lock Company Room, contains over 1,000 locks and keys manufactured from 1854 to 1954. Independence Hall replica lock and key! 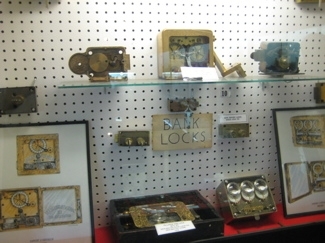 The Bank Lock Room comprises a selection of bank locks, vault locks, safe locks and time locks. 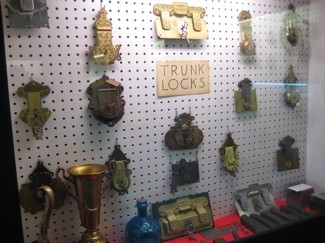 The Corbin-Russwin Room contains a large display of ornate hardware. Several pieces are gold plated and enameled. 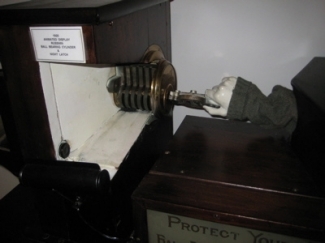 One of the animated displays shows how a pin tumbler lock works. Recently added is a large, 20′ long display of mounted door knobs and escutcheons made by Russwin and P & F Corbin during the Victorian era. These are extensively detailed in styles such as Roman, Greek, French and Italian Renaissance, Gothic, Flemish, and Elizabethan English. 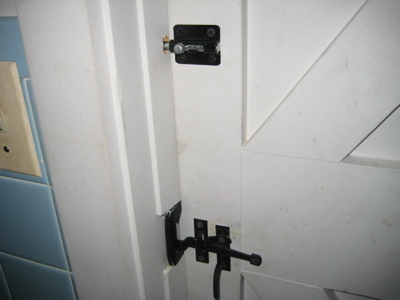 The Yale Room accommodates locks manufactured by the company from 1860 to 1950. 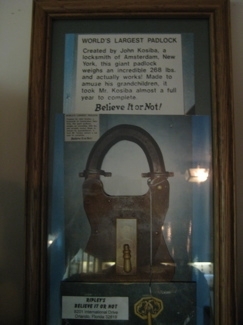 One of the attractions here is the original patent model of the Mortise Cylinder Pin Tumbler Lock designed by Linus Yale Jr., in 1865. While this device is considered the greatest invention in the history of lockmaking, it is certainly not without historical precedence. Close by is that 4,000 year old Egyptian made pin tumbler lock. 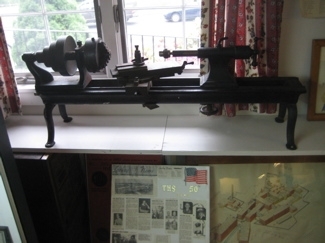 There is also a large display of locks and hardware made by Sargent and Co. in New Haven, Ct. Several early exit devices and door closers are on display as well. And finally, the Antique Lock Room contains a large display of colonial locks and Ornate European Locks dating back to the 1500’s. You get the point. 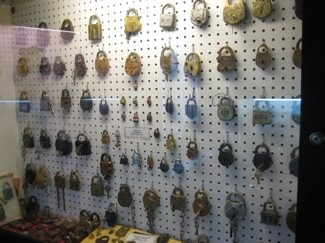 There are a lot of locks at the Lock Museum of America. 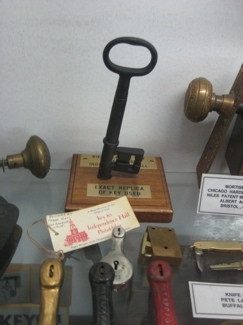 Perhaps my favorite little display in the whole place is the front gate lock from none other than the Lock Museum of England! Yes, the two venerable institutions traded door locks to display in each other’s museums a couple decades ago. I don’t know why, but that cracked Dan and me up. *Update! 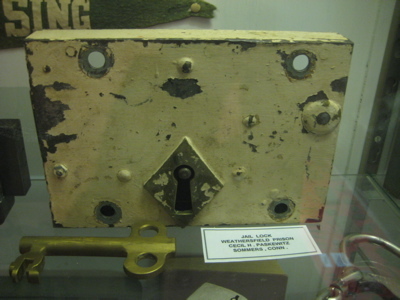 Just found this on the Intertubes: Willenhall (in England) is famous for the manufacture of locks, and the UK’s National Lock Museum was situated within the town until it closed in December 2008 due to the withdrawal of funding by Walsall Metropolitan Borough Council. I’m actually somewhat upset by the news… And I just emailed it to Dan too. We care. As you can clearly see from my pictures, if locks are your thing, this is your heaven. And apparently Dan likes locks. The time was getting late and we had to get back through Bristol to Farmington to pick up Damian, but Dan just didn’t want to leave. He was furiously taking notes (and I took none and yet was able to craft this wonderful posting) and smiling at each new lock discovery. 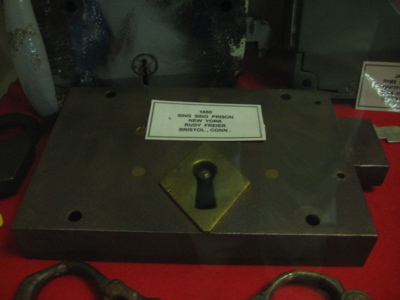 At the least, I can say that Dan surely told someone about his visit to the Lock Museum and for that, I can be happy. I’ve successfully indoctrinated another person into my crazy world. Hi, I am looking to date a Skelton key. I know this much it was made in Italy and it is approx. 7-8 inches long. When you turn the handle the top piece pulls apart and reveals a letter opener or dagger of some sort. Could you help me and figuring out when it might have been made or when they were made. A dagger? Good. Stab yourself in the thigh with it. I came across an Eagle Lock company lock on a piece of furniture I bought that I am looking to date. The lock says s4k18 and is a square base with a post that sticks out which goes through the drawer. It was a single drawer dresser of some sort. Any idea? Ah, yes, the good ol’ s4k18. When dating locks of this sort, you have to be careful. They are what we call “lock-teases.” Your date will be going along great… dinner, flowers, the whole thing and s4k18 will totally be flirting with you, giving you those pin and tumblers you always fall for so hard. But then, just when you think you’re gonna get some hot locking action, she lock-teases you. So I wouldn’t want to date an s4k18. 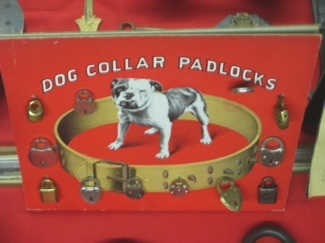 I just bought a big padlock with key at an antique auction in Georgia. Can I send a photo somewhere to help identify and find out if its worth I paid. Thanks! I am the Gatekeeper. Are you the Keymaster? If not could you date this ancient Sumerian lock I have? I have a antique surveying instrument housed in a carrying case with a eagle lock #76P217. The instrument and the lock has the date March 15 1892. Any ideas on how to get more info? We found an Eagle Lock Co. (Terryville, CT), key, #13C11, among my wife’s deceased parents’ belongings In Minn. It reminds me of a railroad switch lock key, but since it is not stamped with a railroad’s initials, I think it must be for another type of lock. It is almost two-inches long and seems to be of brass. 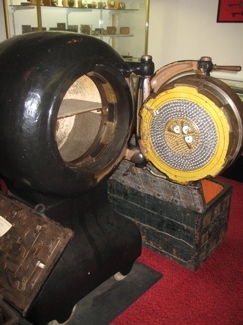 Has a hollow tube with one end flattened to a circle with a hole in the middle. Any idea what it can be? I have an Eagle lock co. Trunk key with the number 30 on it. Can you tell me roughly what year? We are restoring a historical home in Boulder City, NV and have Sargent locks on the doors. They are #605A, 607A, 609A, 612A, & 625A. I have only one key 613A. I continually keep my eye on ebay but have not found any. Any help would be appreciated. What’s awesome about this insane spam is that it’s not too different from the insane lock people above. Hello. I have a cabinet door with a hunt scene painted on its black lacquer front (red n back) painted in 1948. The hinges were removed probably by the painter but not sure. But the door has Eagle lock no 398 on back and key hole on front. I have a ,what I believe to be ,Victorian brass doorknob on the front door of my 1860’s house.the inner mechanism quit working.i can’t get the doorknob apart.the outside nob has a screw in the middle of the handle.have you ever seen one of these ? I’m looking for the complete series of Q Corbin Skeleton keys for a friend. If you have any, could you make a copy to sell? Please email me to let me know. Have an Eagle Lock #2701 with key. Would like to know when manufactured & approx value. CTMQ here – of course I’d typically delete this comment, but on the lock museum comment thread, this seems to be okay. Hence the reason to source for credible and dependable long term suppliers.